From the ramp tower 120 feet above the runway, it's clear Philadelphia International Airport is surrounded by water. There is wetland, a network of creeks, and just a couple hundred yards away, the tidal Delaware River leading out to the Bay. As with many airports, the original idea was to build on a large tract of land convenient to a city, but far enough away from homes and tall buildings. Often, that meant coastal wetlands and landfill. Climate scientists, city planners and engineers say that will become more common as sea levels rise, storm surge and intense rain events worsen, and -- in some areas -- the land slowly sinks. Increasingly, it won't take a major tropical storm to shut down an airport. 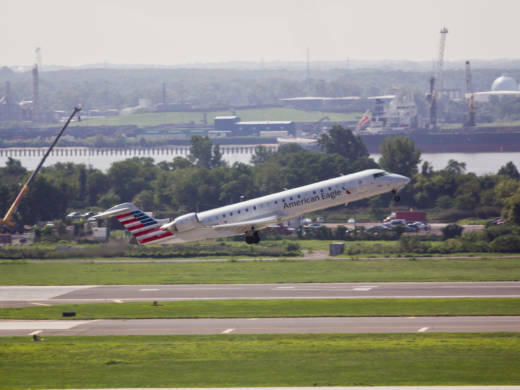 "If we got hit by that, we could have flooding on some of our taxiways or runways," says Ray Scheinfeld, who's in charge of preparing for rising sea levels at Philadelphia International. "We could have problems with some of our infrastructure." In 2013, a storm flooded a tunnel serving one terminal with three feet of water, shutting down baggage conveyor belts and inundating an electric substation. It knocked out all power, and resulted in about 12 canceled flights. Scheinfeld says new facilities built at the airport will also incorporate future sea level rise. "We may put additional fill into a particular area," he says. Boston's Logan airport has raised its electrical equipment and purchased new flood barriers. San Francisco's airport has runways that jut out into the bay. It's already installed concrete berms and walls and is working with the Army Corps of Engineers to do more. Extreme heat has grounded planes in Phoenix. Melinda Pagliarello, of the Airports Council International North America, also cites warmer temperatures that lead to reduced snowfall.